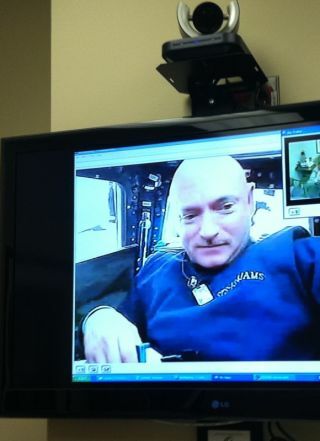 Former NASA astronaut and space shuttle commander Mark Kelly said he and his wife Gabrielle Giffords were shocked to learn of the deadly shooting at a movie theater in Aurora, Colo., Friday. "Gabby and I were horrified to hear of the tragedy in Colorado last night," Kelly wrote in a message on Twitter, where he posts as @ShuttleCDRKelly. "Our thoughts and prayers are with the victims and their families." Kelly's comments came amid a widespread outpouring of grief and support following the mass shooting at a screening of the "The Dark Knight Rises" movie. Seventy people were shot in the attack, 12 of whom were killed, according to press reports. Aurora police have arrested 24-year-old James Holmes as the alleged gunman. Kelly's wife Giffords is the former Arizona congresswoman who was seriously wounded in a 2011 shooting during an appearance in Tucson with constituents. Kelly is a veteran of four space shuttle flights and commanded two. He commanded NASA's last flight of the space shuttle Endeavour in May 2011 before retiring from NASA's astronaut corps. Kelly's identical twin brother Scott Kelly is also a NASA astronaut and veteran of two shuttle flights and an International Space Station mission. Follow SPACE.com on Twitter at @Spacedotcom. We're also on Facebook & Google+.